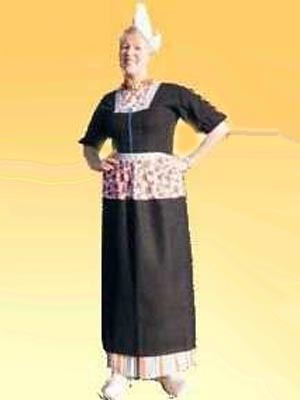 This is the women's costume as it was worn on weekdays. The striped skirt (available as an accessory) was worn only on weekdays. This picture shows you the women's 'sunday dress' or 'fancy dress', which was worn to church. レース帽子、黒上着、インナー、ロングスカート、黒エプロン. This is a copy of the original Volendam costume as it was worn by the people of Volendam for some 350 years. Designed to make the garment comfortoble to wear. Nowadays it is only worn at special occasions events.